LinkedIn has announced the release of Lead Gen Forms capabilities within Sponsored inMail campaigns and an upgraded Dynamic Ads format. Lead Gen Forms for Sponsored InMail positions advertisers to collect lead data at scale using a prospect’s name, email address, job title, company name and other fields from their LinkedIn profile. This allows them to reach more than 530 million members with personalized, one-to-one messages on LinkedIn. 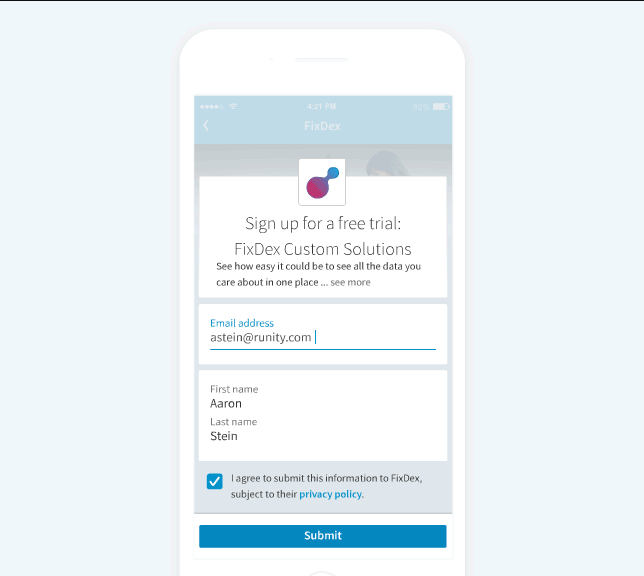 The launch follows the success of LinkedIn’s Lead Gen Forms for Sponsored Content that launched in April 2017. The solution is designed to help marketers generate more leads from sponsored campaigns by automatically filling out forms using a prospect’s LinkedIn profile information. The company reported that Lead Gen Forms helped reduce marketers’ average cost per lead by more than 20%. The company also announced the addition of custom questions to Lead Gen Forms, a feature that can collect lead data beyond the standard fields provided. Users can add up to three custom question fields and a blank field for open-ended questions. Additionally, LinkedIn has unveiled a new Dynamic Ads lead gen format that is designed to help users generate leads and enable content downloads directly from the ad unit itself. The upgraded Dynamic Ads format is now available, and Lead Gen Forms for Sponsored InMail will be available for all customers in the coming two weeks.